@ilmm @Di~ It's refreshing reading what you guys been discussing. I actually don't really care with drama ratings and I don't even watch those most talked about dramas (until maybe months or years later). Ratings do not guarantee that you would actually like a certain drama but it definitely can be a good indicator. Of course the higher the ratings get it is beneficial to the directors, writers, actors, etc. yes... i totally agree with you.. i'm very interested with @ilmm and @Di~ discussion too, but i don't agree Fuyao didn't get hype enthusiastic in mainland or overseas, because until now i can see how many people still post about the photo or videos of fuyao, even though that series has finished aired and their comment and discussion about this series, and many of them is very miss this series, miss our wufu couple... and feel so lost because this series has finished aired , besides that i see who is comment this series is from different countries, some from vietnam, some from thailand, some from indonesia, some from korea, some from america, some from brazil, some from mexico and maybe some form anothers country, so how can we say fuyao it's not popular in overseas? and in mainland who say it's not popular too, how many people on weibo enthusiatic too with this series? and we all know Ethan's Followers increase greatly after fuyao..so i'm believe also in mailand fuyao is popular too and got a warm welcome too from viewers. i'm very agree too with @rinkyu rating is not guarenteed for one series too, high ratings not always make you like that drama. so i'm personally same with you. actually, i'm very choose to wach drama, because sometimes have good story but i don't like the lead, i can't continuos watch too, but if i like the main role but the story not interested for me, i will dropped out too. but i'm very like fuyao, the main role, the support cast, story and its views, i'm totally love it. so although the rating of fuyao will be very high or not. fuyao will be my best mainland c-drama now and wufu couple is always be my best couple and no body can replace their place in my heart.LOL.. Allow me to reply to you one last time as well. I hope our discussion stops at here. Rating is one indicator but I rarely judge drama based on its rating anyways. So now Let's forget rating and all any other dramas since we can't compare them together anyways. Maybe I misunderstood your statement cos I thought you said Fuyao is not successful at all, and I apologise for that. But please let me make myself clear. Never in my statement did I intend to say Fuyao is the most successful drama nor did I want Fuyao to be the most successful or did I want it to be more successful than it actually is. What i say is Fuyao exceeds all my expectations and to me the drama has made a great success. However, I also said others may not feel the same since their expectations and their experiences of the drama are not the same. Some fans and I may feel the hype about this drama but not to the level as the most talked drama, but it has some hype in there. But I never desire it to be the most talked either, and it doesn't need it to be because this much is good enough for me. Of course Fuyao is more famous than some dramas but less famous than some other dramas, which is expected. Nothing is perfect, but this level is already good for me even not for others. I hope I made myself clear this time. Anyways, thanks for chatting with me throughout this time, and I hope our discussion ends here and really appreciate if you won't continue further. Since the discussion is over, can we continue our game? Share your thought of most funny and most irritated scenes from LOF. I want to post mine but don't have that much time, will post at evening. but﻿ i'm very like fuyao, the main role, the support cast, story and﻿﻿﻿﻿﻿﻿ its views, i'm totally love it. so although the rating of fuyao﻿ will be very high or not. fuyao will be my best mainland c-﻿drama now and wufu couple is always be my best couple ﻿﻿﻿and no body can replace their place in my heart.LOL..
Yeah you should try both. It’s up to you which one first. Those 2 drama are the most successful drama in China. And they are really successful too overseas. Maybe you’ll regret watching PA but well at least you’ve tried it. I don’t have any regrets but i realized that people who loved HE hated the ending. But I loved it till the end. I even managed to get some of my friends who hate chinese series to watch and discussed it everyday (but they complained everyday about how bad the CGI was) Haha. I must admit it’s far from perfect. The production value is not that great but well I loved it. because i don't really like that cast and their appearance, for me some of the main female cast at that series looks rather old..hahaha... and i don't really like their hairdo likes too flat..( i'm sorry this is just my opinion) maybe yanxi has an interesting line story that makes it have a lot viewers too but i'm personally not very interested to watch it. But you can not deny it’s really succesful. And it’s more successful than Fuyao in China. So lovely. Both are reading. Still my best drama. Best OTP. Wuji and FuYao. Ethan and Yang Mi are good actors. Much love from Philippines...watching again on viki. God bless us all. Thanks for calling it refreshing. Haha. I think it’s just me being stubborn. 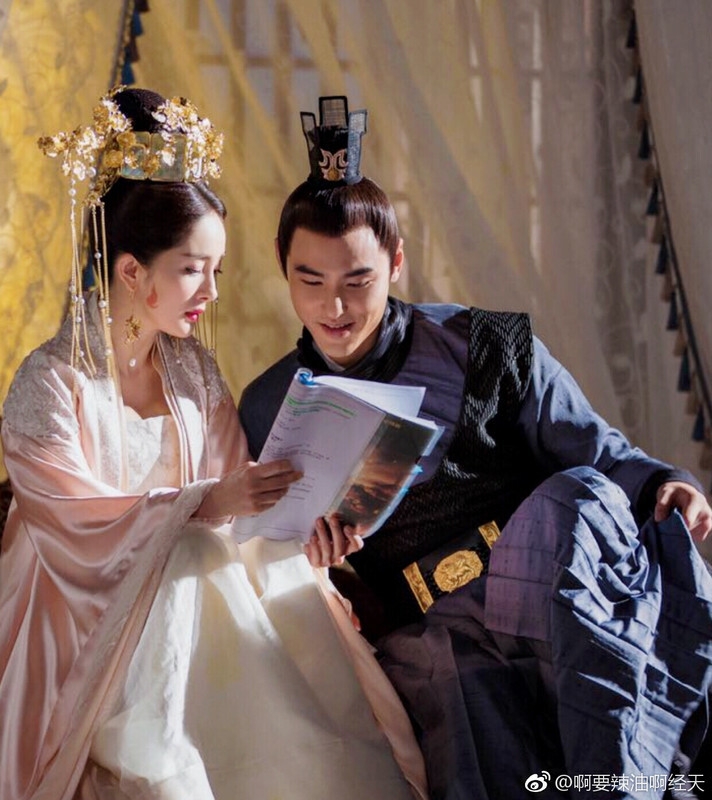 But well you guys have to know that I feel proud of Fuyao (mostly and mainly because fuyao is Yang Mi’s best performance so far). I just hope to see it gains more than it already has that’s why to me fuyao can’t be categorized as a HuGE success. Yang Mi has achieved much success in her career. Bees usually say that Yang Mi can only be compared with herself. Sadly Fuyao didn’t manage to break her own records. well, I believe someday she’ll manage to do it again. Of course ratings do matter. It still indicates how success a drama is. People can’t claim a drama not successful if it gets good ratings. As for the hype, I only state what I witnessed on weibo in general and on Yang Mi’s supertalk community. I don’t join wufu community (the community that I’m sure feel the most hype of this drama. If they are still talking about it, great then because I can only say that Yang Mi’s fans have already moved on and well you can’t blame them if they don’t love wufu as much as you all (except me) here do because they only focus on Yang Mi. It is a matter of preferences imo. Personal preference is still the best tool in assessing which dramas to watch and to like. Sometimes I watch dramas for their actors and if the plot not compelling enough then I just drop it. Totally agree. Can't argue with what you state here. We have exactly the same thought. This is why I love her and will always. I want those cookies too but I'm afraid I won't be able to eat them Too precious. Agree with you. It is a matter of preference only. Well said. Exactly the same thought. My pleasure to be here with you and all of you. Of course, I also have my own favourites. Let's share together in the evening. Oh wow Re the adorable cookies! 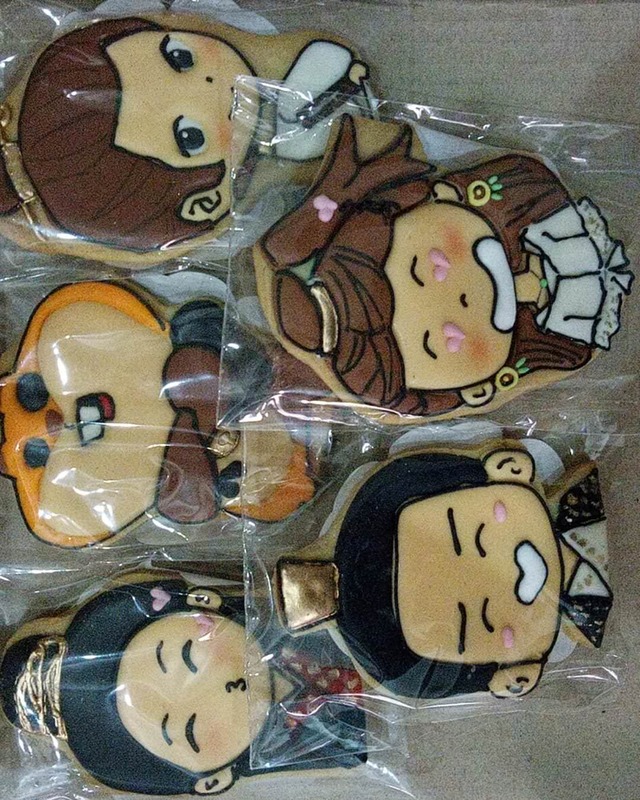 That is pretty accurate looking chibi character cookies!! 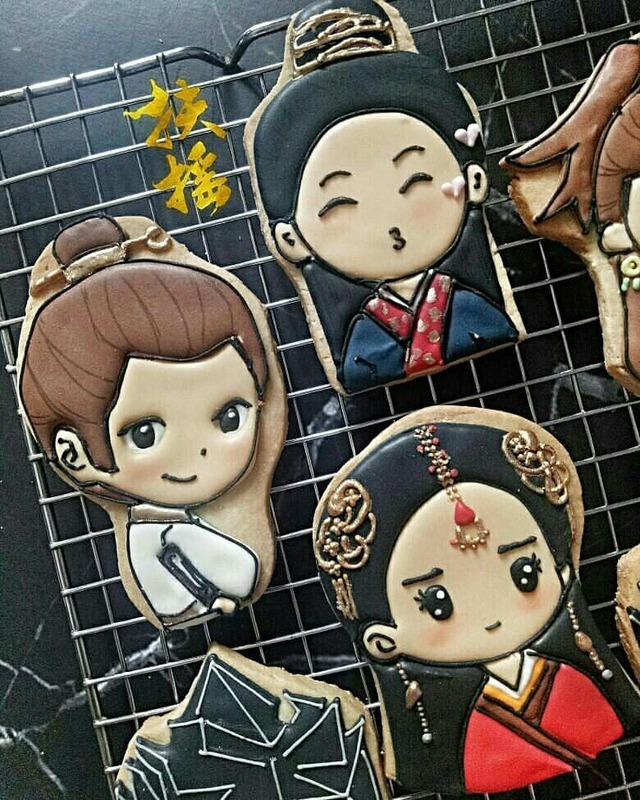 Fuyao wearing the fake Folian red costume cookie!! 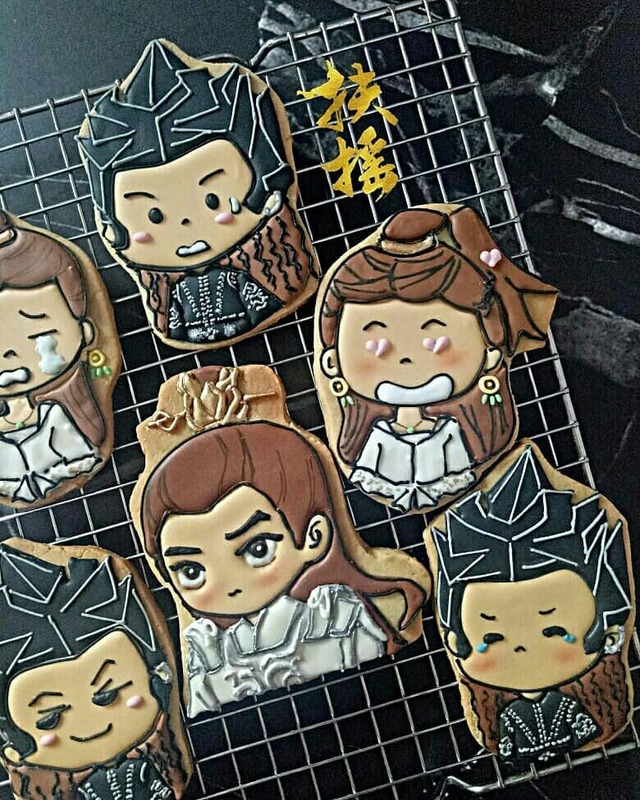 I need a photo of WuFu cookies sooooo cute. Def would not eat it. Oh wait! That is Wuji in white in the last photo but his jaw is off hence I didn’t recognize him lol! Bad cookie! Overall I still prefer LoF than PA. As for TMOPB I like the second lead couple more (Vengo and Reba) than the main couple (YM and MC).